I like to remember that it is wild country that gives rise to wild animals; and that the marvelous specificity of wild animals reminds us to wake up, to let our senses be inflamed by every scent and sound and sight and taste and touch of the world. I like to remember that we are not here forever, and not here alone, and that the respect with which we behold the wild world matters, if anything does. By the time I got over to the Pungo Unit of Pocosin Lakes, it was mid-afternoon. I did a quick drive through, checking an area where my museum friends said they saw a bobcat the day before. Unfortunately, no bobcat for me, so I drove on, looking for bears. I parked and walked down the gated dirt road to an area where bears have been active. With overcast skies and a long walk, I took only my tripod, 300mm lens, a 1.4x teleconverter, and my Kwik Camo photography blind. This is a handy camouflaged cover with slots for your hands, lens, and flash units. It comes in a camo fanny pack and is very light, so it is no problem on a long walk. 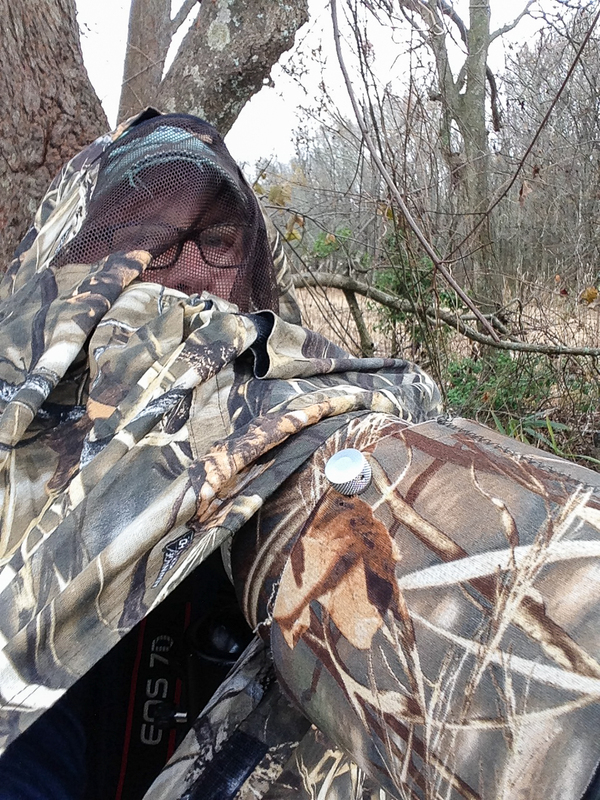 I wanted to try standing for awhile along the tree line under the blind, just to see what I could see, even if there were no photo ops. I picked a spot near where bears were obviously crossing the dirt road from the woods to the bounty of the corn field. 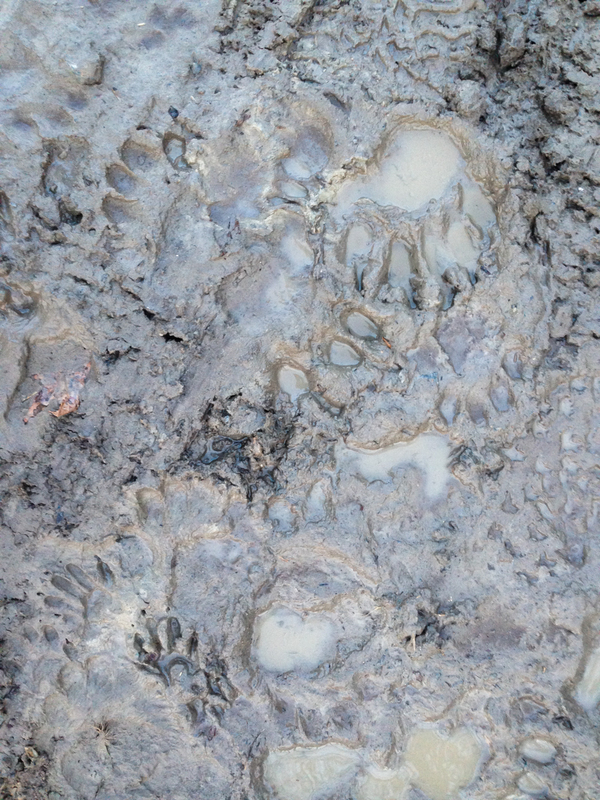 There were three such bear highways along the path – easily noticed by the trail of wet soil that could be seen from quite a distance. 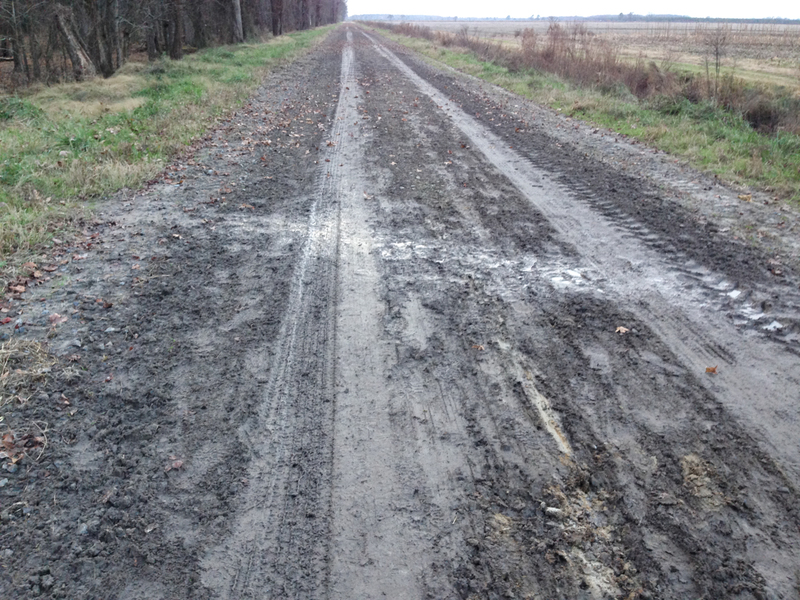 Track highway…can you see tracks of at least three mammal species? There is usually plenty to observe while waiting in a blind. 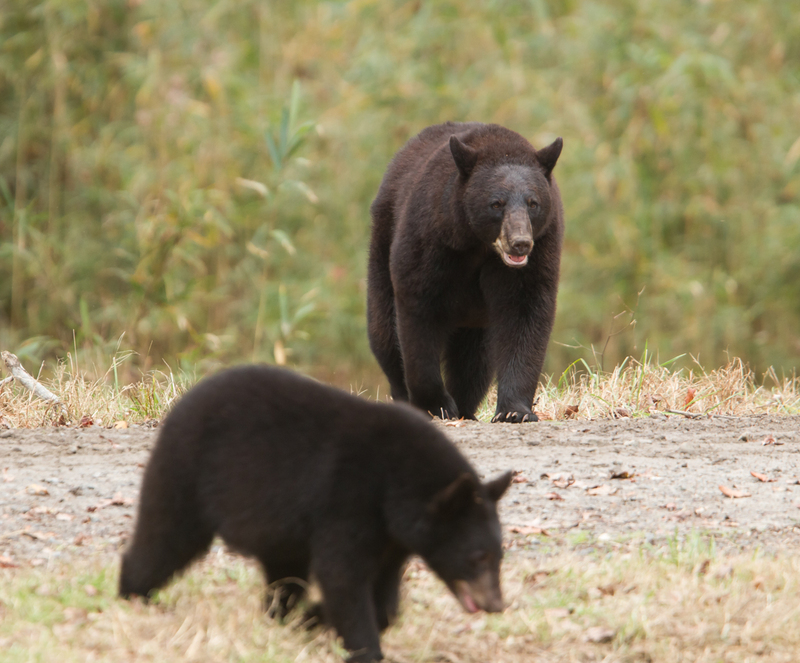 To my right, I watched a hawk hunting over the field and when I turned back to my left, this is what I saw – an adult female and a young bear coming out of the woods, headed toward the field. There was almost no wind, so I don’t think she sensed me, as she cautiously came out and went down into the canal for a drink. I swung the lens around and pointed it toward where the pair had disappeared along the canal bank when a slight motion to my left caught my eye…another young bear was walking down the tree line I was in and suddenly realized that the bush next to the tree (that’s me) moved . It stared at me for a second and then ambled off toward its mother and sibling, glancing back from time to time to see if the bush moved again (I didn’t). I always try to not disturb the wildlife I am watching. 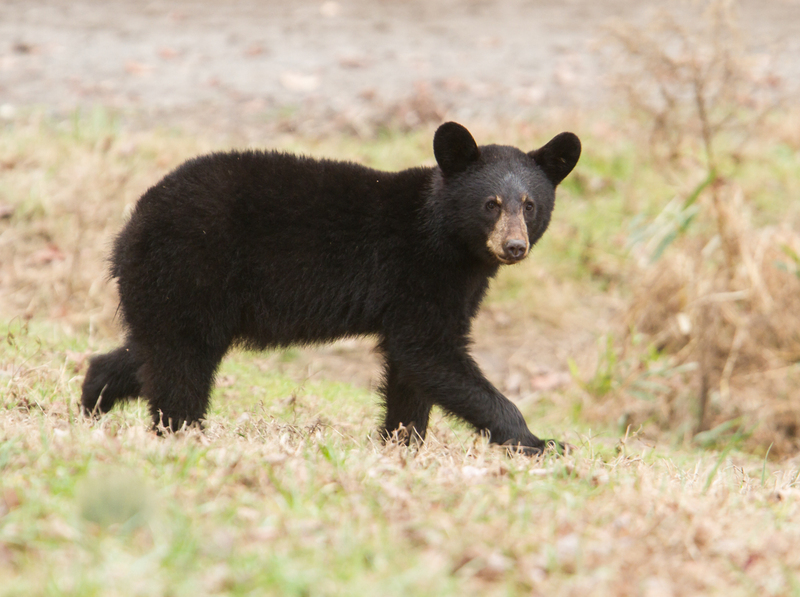 But this young bear had seen me (and perhaps heard the camera shutter – boy, it seems so loud at times like this). 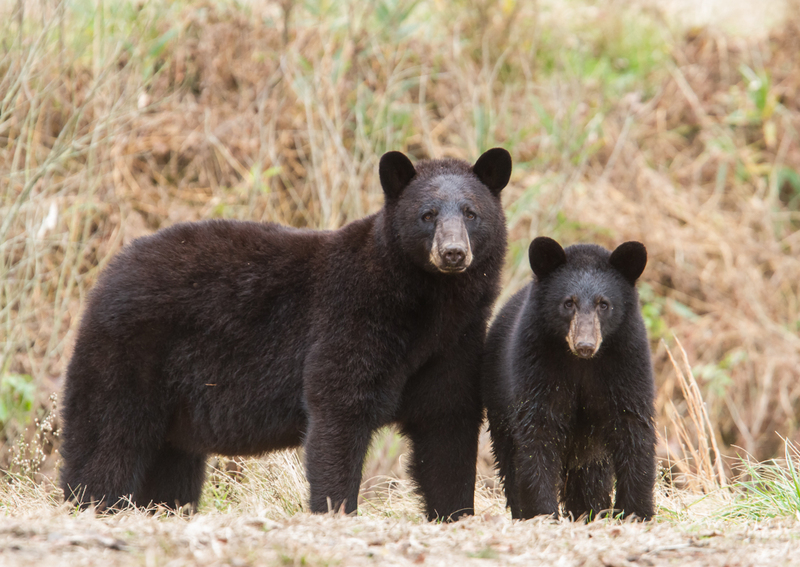 When the other two bears came up out of the ditch, the sibling ambled off toward the dinner table (corn field), while the mother looked at her other youngster staring at me and then looked around, before finally fixing her gaze in my direction. I shot two images and then remained silent. She continued to look around, sniffed a few times, and apparently did not sense anything to worry about, so they both headed off toward the corn. I watched them for another thirty minutes as they fed far down the field from me, and then I headed out toward the car about a mile away. It is always a special feeling when I am able to observe wildlife doing what they do without them becoming alarmed at my presence. The day had been a great one, although strangely warm for early December. I saw two species of butterflies out earlier in the day, and as I walked back, a few bats came out for an early hunt. Five other bears came out of the woods as I walked, most a great distance from me. A Great Horned Owl started hooting as the sun was reaching the horizon. A Corn Snake crossed the road. And then I heard them coming…the birds returning to the lake for the evening. I paused as the first wave of Snow Geese flew overhead. Smaller groupings of Tundra Swans were flying in long V’s underneath. I was alone in this magical place and I felt incredibly lucky. I shot a short video with my phone hoping to capture a little of that magic. But, there is no substitute for being out there and taking it all in, realizing that these special places are essential for both the wildlife and the human spirit. Listen for the differences in the calls of the returning flocks – the high-pitched, somewhat nasal quality of the Snow Geese honks, and the lower-pitched hooting of the Tundra Swans. NOTE: I am offering trips in this extraordinary region the first two weekends in January and possibly another in February. Contact me at roadsendnaturalist@gmail.com for details. This entry was posted in Natural History, Nature Photography, Trip offering, Trip report, Uncategorized and tagged black bears, photo blind, pocosin lakes national wildlife refuge, pungo, snow geese, tracks, tundra swans by roadsendnaturalist. Bookmark the permalink.